Huge online collection of rubber floor mats, rolls and tiles. For domestic and commercial use. Non-slip rubber flooring in a variety of styles, cut to size to suit your application. Kitchen and Bathroom flooring, gym flooring and weight mats, stable flooring and outdoor mats. Matting for all types of applications, available in different widths, thickness's and colours. Polymax offer a variety of different matting tiles in different styles and sizes for use indoors and outdoors. Quick and easy to install rubber flooring, often used in bathrooms, kitchens, camper vans and offices. Available in various colours in either a studded or slate effect design are used in kitchens, offices and bathrooms. Non Slip and available in a variety of colours to add colour to your bathroom. Excellent choice of colours to brighten up the kitchen with a hard wearing, non slip design. A range of sport focused rubber matting products suitable for gyms, swimming pools, wet-rooms and playgrounds. PVC improves durability which makes this type of flooring ideal for garages, workshops and manufacturing plants. Swimming pool matting - Durable, resilient and especially designed for wet area application where grip is required. 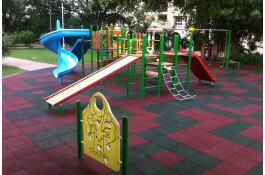 Range of matting options for Playground surfacing. FINA electrical rubber matting is ideal for switch boards and high voltage areas. Supplied with a Anti-slip top surface. Horse stable mats in a premium rubber compound. Range of matting for your horse trailers, stables and walkways. Oil resistant, tough, anti-slip flooring perfect for a garage environment.